The principle of this patented solution is horizontal tilting of frames at both long sides of container. 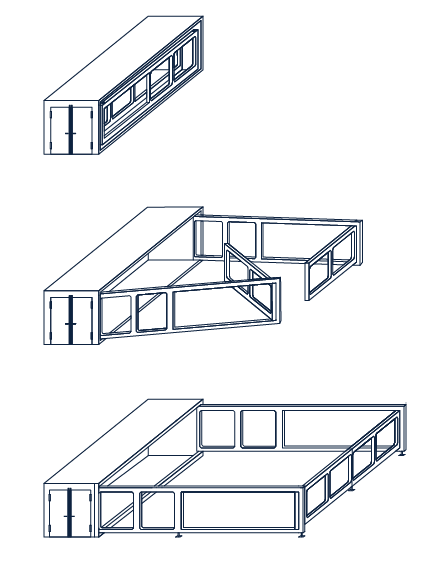 After tilting of main and supporting frames, separate halls at both sides of container are made, together with an empty container creating three separate spaces. 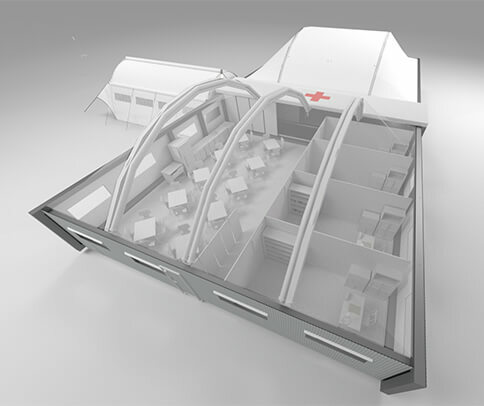 While the container itself shall be used as a communication corridor, the halls are supposed to work as an accommodation space, an ambulance, briefing hall, as a canteene, warehouse etc. 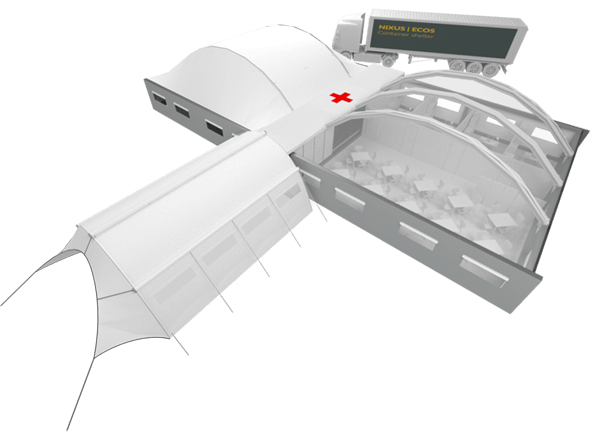 The roof of ECOS shelter is based on inflatable high pressure NIXUS | RIBS system, which creates rigid inflatable beams over the area and supports the membrane roof. The floor is made of heavy duty, antislippery PVC coated fabric, which´s perimeter is fixed to the walls and creates asafe barrier to the water or animals. Tilting frames may be covered with PVC coated fabric, or with light solid panels. In such case windows, evacuation doors, electricity installation or even water distribution may be the part of side walls as a scope of the delivery. Electric aggregate, air conditioning units, as well as, the floor tiles and the furniture may be transported directly in a container as one compact transport unit too. 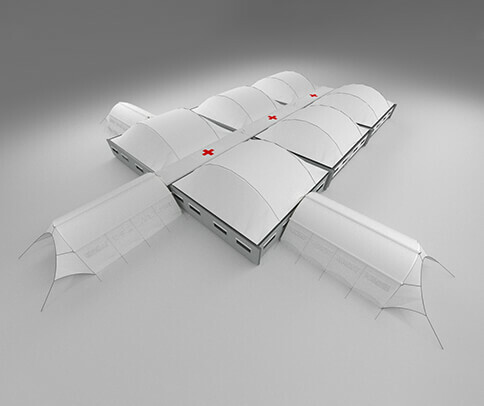 An estimated time of the installation of the whole ECOS shelter complex from the moment of truck stop is up to four hours for two trained persons. 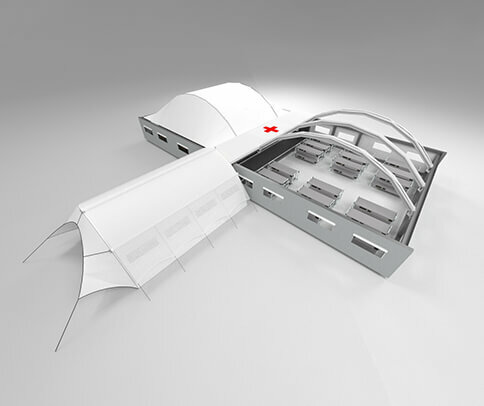 NIXUS | ECOS is a modular system. 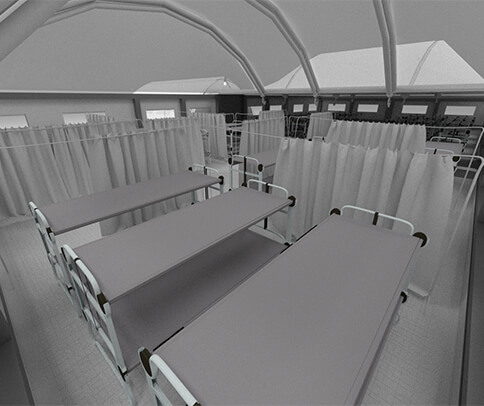 It is possible to add other ECOS units to the back (connecting freight containers on short side) or by the side (connecting one expanded hall to another). 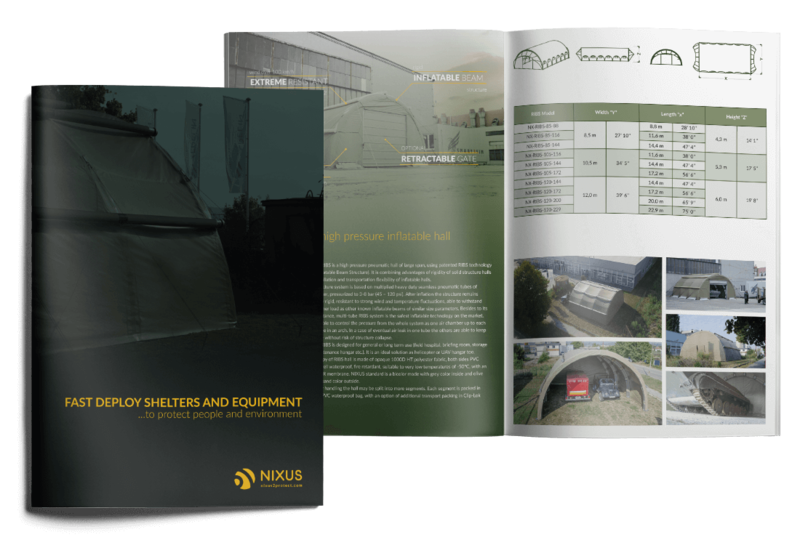 It is also compatible with NIXUS | PRO shelters to be connected via tunnels, creating a complex modular infrastructure.